Cary Sports Chiro Blog: Is your Cardio Working for you? Is your Cardio Working for you? Which Cardio Are You Doing?? Which one of these athletes bodies appeals to you? 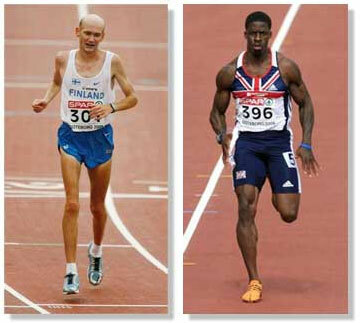 The fellow on the left is a long distance runner, the fellow on the right, a sprinter. 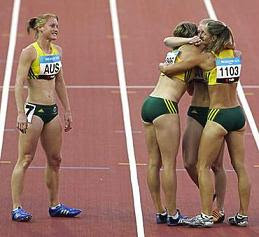 The choice is quite easy for me, the long distance, marathoner look is not what I like on me or anyone else. It looks haggard, unhealthy, old, tired, weak, frail, not strong at all. The sprinter? Holy Cow! Now that's a body! This guy is what women must be naturally attracted to, when they are unconsciously looking for a mate- strong, virile, healthy, protective, full of energy. Again, the marathoner looks anything but healthy. Keep the bodies in mind when you plan your cardio. Do you hit the gym and all you ever do is an hour or even longer on a cardio machine? 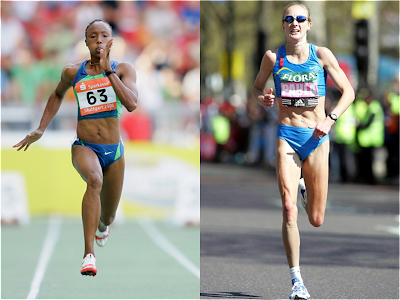 Endless, slow cardio will just eat away at your body producing an emaciated look, like our marathoners in the pictures above. You must stop doing this! Ladies... Want firmer, toner legs and glutes?? You can do this type of training on a machine, like an elliptical or a treadmill!! Below is a sample chart showing how your heart rate "peaks" eight times during a interval session. Also note how the anaerobic threshold rises with each repetition. You will certainly want to work your way up to this point, but ultimately you want to exercise vigorously enough so you reach your anaerobic threshold as this is where the "magic" happens that will trigger your growth hormone release. You will start to sweat profusely. Typically this occurs in the second or third repetition unless you have a thyroid issue and don't sweat much normally. Lactic acid increases and you will feel a muscle "burn"
Be mindful of your current fitness level and don't overdo it when you first start out. Also keep in mind that there's no "magical" speed here. It's entirely individual, based on your current level of fitness. Some may reach their anabolic threshold by walking at a quick pace, while others may need to perform a mad-dash to get the same effect. If you are out of shape you may want to start with just two or three repetitions, and work your way up to eight, which is where the magic really starts to happen. If you can do a Innate Cardio workout twice a week you will increase your production of growth hormone (future article) and start to loose the weight and gain the muscle you are working sooo hard to acquire. Try it and I promise you will succeed. P.S. if any of you are interested in doing a program like this Please visit New Order Crossfit and Get an additional 10% OFF!!! Myofascial Lines? What are you talking about?